Cairn G on a misty May morning. The plain of Sligo is covered with mist. On the horizon are Knocknarea, left and Sliabh Da Ean with it's notch, right. The large, mysterious erratic boulder, right, seems to be a part of the complex, and casts shadows like a sundial. In the first cairn opened (G) there was an entrance passage, a polygonal central chamber, and three polygonal cells around it, evenly disposed. Several sill-stones divided up the entrance passage, and a sill seperated the central chamber from each of the side chambers. Between the sill-stones, each section of the floor was paved with a large slab. The roof was formed of large overlapping slabs, sloping outwards. It was a most symmetrical and beautiful piece of architecture. I had the privilege of being the first to crawl down the entrance-passage, and I did so with no little awe. I lit three candles and stood awhile, to let my eyes accustom themselves to the dim light. There was everything just as the last Bronze Age man had left it, three to four thousand years before. A light brownish dust covered all. The central chamber was empty, but each of the three recesses opening from it contained much burnt bone debris, with flat stones on which bones had evidently been carried in, after the bodies had been cremated in strong fires outside. There beads of stone, bone impliments made from Red Deer antlers, and many fragments of much decayed pottery. On little raised recesses in the wall were flat stones on which reposed the calcinated bones of young children. This brief description gives a sample of the construction and contents of the more complete cairns. R. L. Praeger - The Way That I Went, 1937. 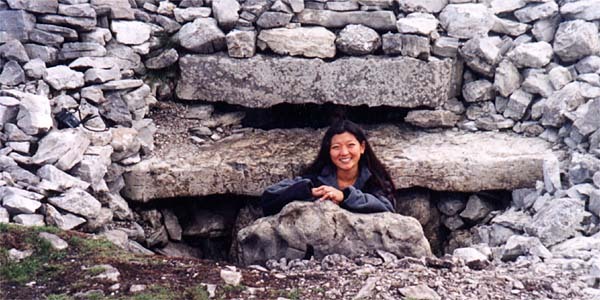 Cairn G in 1997. Note stone door and roofbox; this is one of the most intact cairns remaining at Carrowkeel. Cairn G was discovered by R. L. Praeger, who visited Carrowkeel in 1897 and returned in 1911 with Armstrong and Macalister to excavate the cairns. Cairn G is the first cairn the visitor meets above the top car park at Carrowkeel. 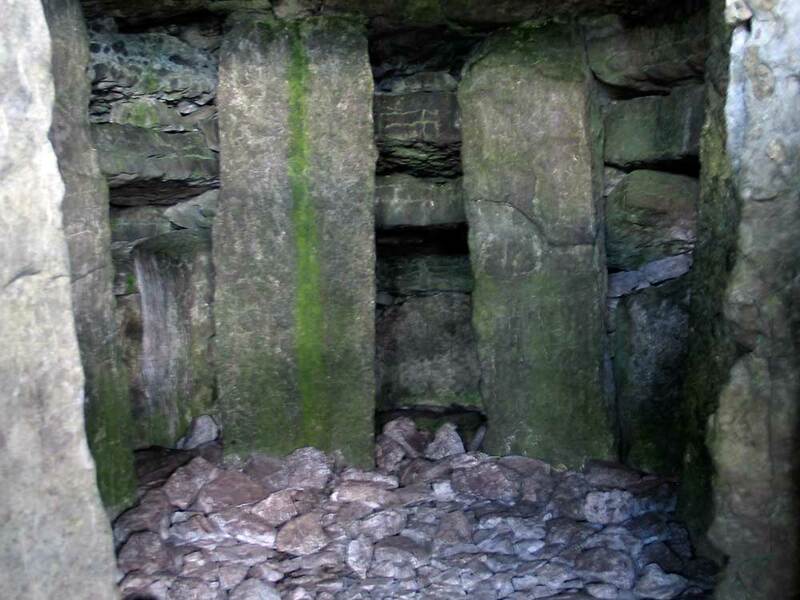 It is the best preserved of the Carrowkeel monuments, being a fine example of a cruciform Irish Passage Grave, little disturbed over the last 6,000 years or so. Possibly the most exciting feature is the roofbox and midsummer sunset alignment which are described below. The cairn is situated at 290 metres above sea level on the north end of Carrowkeel Mountain. There is a fine wide panaroma directed to the north and north-west with Knocknarea and its great cairn dominating the north, and Kesh Corran to the west, with Croagh Patrick clearly visible in the south-west on a clear day. The view to the east is almost like a stage set with Lough Arrow and Moytura in the foreground, and the Arigna Mountains and Sliabh an Iarainn behind them. The base of the cairn and most of the north face are buried under the bog, with one kerbstone, a gneiss boulder, visible west of the entrance. These monuments were built before the bog grew, and the terrain of Carrowkeel was probably something like the Burren is today. The diameter of the cairn is given as 21 metres. There is a large flat flag on the western side, which presumably covers a stone coffer or cist like the one east of Cairn K.
The chamber of Cairn G is a fine piece of engineering and was much admired by Macalister in his writings of the 1911 excavation. Within the chamber of Cairn G, looking to the end recess. Access is gained between the door and lintel and there is room for several people within the chamber. The floor of the chamber and recesses were covered with limestone flags; they are covered with loose cairn stones at present. The walls are composed of eight orthostats, which were split and trimmed and give a fine sense of balance and symmetry. The roof rises on two large corbels to a massive covering slab. The recesses are flanked by orthostats and there is a window-type slot over each recess. This unusual and unexplained structural feature, which is also found at Cairn K, seems to be a unique element of the Carrowkeel building style. The stone door slab still remains in place, with an unusual slit in the right hand side. To judge by the craftsmanship in this chamber, Cairn K and from the plan and elevation of Cairn F, the Carrowkeel builders were excellent stone masons. A selection of pendants found in the chamber of Cairn G (not to scale). The finds in Cairn G are typical of Irish Passage Cairns: bones, lots of burnt bones, cremations, many fragments of pottery; a selection of beads and pendants, one of which is decorated with a spiral design (above, left); and five stone balls, which may have been used to represent the moon. Herity believes that some of the smaller pendants may be small models of Breton stone axes from the Carnac region (below). The pendant with the spiral helps link Carrowkeel with megalithic art, otherwise only known in the region at Cairn B, Heapstown and Listoghil. Take a virtual tour of five of the cairns on the excellent Voices from the Dawn Carrowkeel page. A sunset near the summer solstice viewed from Cairn G.The sun is about 3 degrees from the flat-topped Doomore, the solstice setting position. Croughan, the lunar standstill marker is the leftmost of the two pointed hills. Knocknarea is on the extreme right.